I meant to post this on Tuesday, the one year anniversary of us adopting Tikanni, but I kept forgetting to make the collage and post it!This beautiful energetic goof ball has been a part of our family for a year now! What a year it has been, we moved down to Texas, and then back up to Iowa, and she has been amazing and so calm through it all. Can’t imagine our lives without her! She is so loving to Evie and loves playing (and secretly snuggling) with the cat, Percy. Thank you to Sarah Andrews and Marla Theisen for helping us get to know this amazing dog! Looking forward to many more fun years with her! This update from sweet Xara’s family: Xara is unbelievably dog savvy. She is a rescue that helps rescues…..🤗I work closely with three local rescues. My training facility is where the “returns” come. Often times the dogs are returned because they lack social skills. Xara has been playing a key role in the evaluation and rehabilitation of the dogs. Her ability to communicate with and to calm these dogs expedites the entire rehabilitation process. She helps me trust, communicate with and understand dogs that I have misread or been overcautious about. She is so patient with every dog wether they act aggressively, have an over abundance of rude behaviors or are afraid of their own shadows. Observing her reminds me that with patience and an open mind I can understand who a dog truly is without listening to the stories that their previous “owners” attach to them. When she meets a dog, she doesn’t know their past, everyone gets a fresh start.We ❤️ this amazing dog more every day. Thanks again!! Kaiser, Kiva, & Meshik all found new homes over the holiday weekend.These 3 will hopefully be joining us sometime the weekend of the 9th & 10th. We have a 2 year old male (top), 4 year old female (bottom), & an 8 month old female (right). Here is an update from Ayala:Can you believe it’s been 2 years?!?! Ayala has been such a blessing to our little family! She has such a spunky personality! She spends her days playing ball and laying with her blankey! We recently moved to a new house and she has her couch by the window and keeps an eye on the neighborhood! An update from Clyde’s family: Good Morning,Just thought I would keep you in touch with Clyde. Just came back in from doing chores…that is one of his favorite things to do. He just layed down in the kitchen for his mid morning nap with Savana…yes he does get along with her. He used to have anxiety attachs when we left him alone, but he feels safe when left alone with Savana. He is very attached to home now & likes to stay within sight of the house. He is a perfect fit. Thanks again Susan. And here is an update from Irina & Nani: Here’s a snap of the girls just hanging out with me this morning. I had just brought them back inside. There’s also one of Irina on my lap the other night.Irina on her mom’s lap is a great accomplishment for this very skittish little girl. Here is an update from our sweet little Mavra, n/k/a Xena: It’s official, Xara passed her CGC test and she isn’t even a year old yet. My 13 year old Gracie has worked very hard with her and they have become quite the team. They both made me very proud! An update for Misha…..Misha (fka Kiska) posing in the snow. Happy 1st birthday to Eska! And here is an update from Mavra n/k/a Xena’s family: Wanted to share Xaras’ smile with you. This weekend was her first trip of many to the family farm and lake house. Here’s an update from Kaos’s family: 🙂 Marla,Just wanted to give you an update on Kaos since it will soon be a year that he has been with us. He has been great and loves to snuggle and play with his sisters, and he has become quite the lap dog. 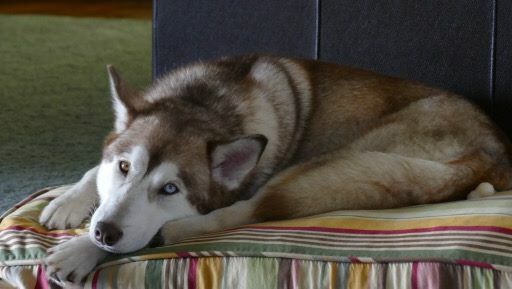 We just recently adopted another female husky that could not be cared for by her owners. So, we are getting closer to having our own sled team. One thing for sure, it is never a dull moment around the house. Neva & all 6 of her puppies have forever homes! We are so excited & happy for them. We can’t wait to see them as they grow. A huge THANK YOU to the fosters & adopters. You are all wonderful! Today we heard from one of our sweet little puppies, Xara, f/k/a Mavra: How fast they grow!Xara loves the snow, learned that we think it’s adorable when she brings us her food bowl for dinner and is studying hard for her Canine Good Citizen test. She will take her test February 13th. Hopefully the next update I send will be about my Canine Good Citizen. And here’s an update from Tundra, in the snow if you can imagine LOL!Tundra (aka Tunnie) loving the snow, me not so much. Here is an update from Keegan f/k/a Keechee. 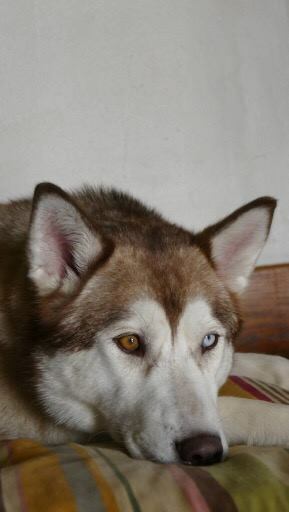 She & her mom, a husky, came to us together when she was very young. Hello, Sorry it’s been so long since an update! Keegan is doing so well. Healthy and happy 🙂. She has a new (human) baby sister and most of the time she likes her. Now that Piper is starting to move around a bit more, Keegan is quick to move out of her way. Lol. Keegan still keeps her big sister, Josie on her toes and loves to chase her. She’s loving this snow and the colder weather keeps her nice and spunky. 😏Helping to keep her sister’s hands clean. Helping with Pipers 8 month photos :). Jumping on her Aunts lapKeeping a close watch at the park/ Babysitting her sister. As always, thank you for our baby girl, Keegan! Our lives wouldn’t be the same without her 🙂 – Jim, Abby, Piper, Josie, & Keegan! We also heard from Esmae’s family:Esmae loving to see snow on the ground again. Can’t get her inside! She’s doing well! Here is an update from our little tripod, Tikanni: Marla,Here is an update on Tikanni. Tikanni is doing very well here in Texas! She is loving the colder temperatures we have been having and loves spending time outside with the two Saint Bernards we have! She loves our 1 year old and is so gentle and patient with her! She has learned that cats are her friends (or at least her boss) and recently we went through some basic obedience training with her at home with the other dogs and she did great! She has calmed down so much and is a great addition to our family! Here is an update we received from Aurora’s family right after Christmas. Sorry it is late. I had quite a few updates & they are all so appreciated! We love to see our past furbabies & hear how they are doing! Aurora continues to be such a blessing for our family! We wanted to send you this picture of her staying cozy with our kitten, Fimbly. When we brought the kitten home Rori looked at her like “You got me a kitty?! Aww thanks guys!” and has been like a puppy momma since day 1. That was 5 months ago and these two snuggle and play more than we’ve seen any other dog and cat pair. Just wanted to share the cute moment.Hope you and your loves stay warm this New Year! Here is an update from Saban’s family: Saben has been doing great, he is learning a lot and making a lot of new friends. I have attached some pictures for you of his first day care visit, first Christmas, and first snow 🙂 We have been working on running and training everyday.